Looking for ideas for upcycling furniture? You have come to the right place. Everyone wants to put their mark on their home, but buying off-the-peg furniture means your home risks looking like a clone. Bespoke pieces, on the other hand, can push your budget through the roof – that is unless you create your own. Step in the ever-favourable practice of upcycling. And who better to walk us through how upcycled furniture can improve a space than Sarah Parmenter from RelovedMCR. Her love of turning something old into something fabulous and new – then using these pieces to decorate her home – has brought her a dedicated troop of Instagram followers. Having worked in the interiors industry for some years, she also runs her own company creating beautiful one-offs for other people to furnish their homes with. Here, Sian Astley talks to Sarah about how upcycling second-hand bargains is the perfect way to personalise a space on a budget. 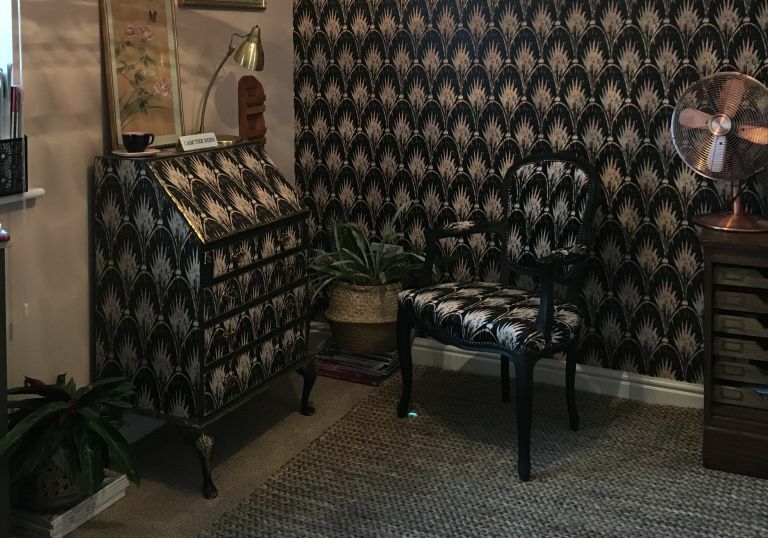 And if that wasn't enough to whet your upcycling whistle, Sarah has kindly put together this handy step-by-step to show you how to upcycle your own furniture with your favourite wallpaper. Be it an Ikea chest of drawers or a dated piece from your local charity shop, you can makeover any piece of furniture with ease and be recreating Sarah's grunge-glam look in your own home in no time at all.